Sunday 10th March 2013- Colin’s Birthday! The end of a fantastic weeks holiday but more to celebrate as it’s Colin’s birthday today! We decided to stay in a get some rest and relaxation before we go back to work, and needed some yummy delights to mark the day. Yesterday morning I popped along to the Farmers Market and picked up some nice bread, cheese and salami for today’s lunch. 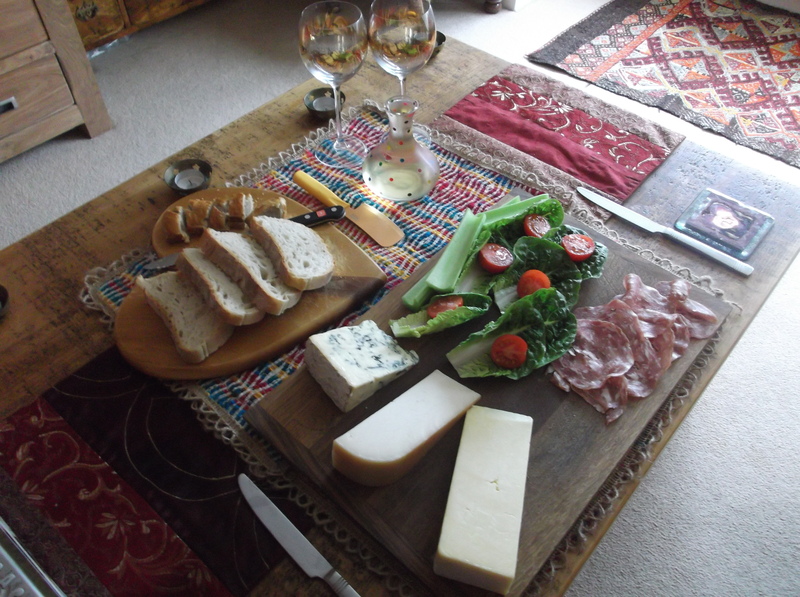 A bit like a lounge picnic, with some chilled vinho verde brought home from Lisbon. 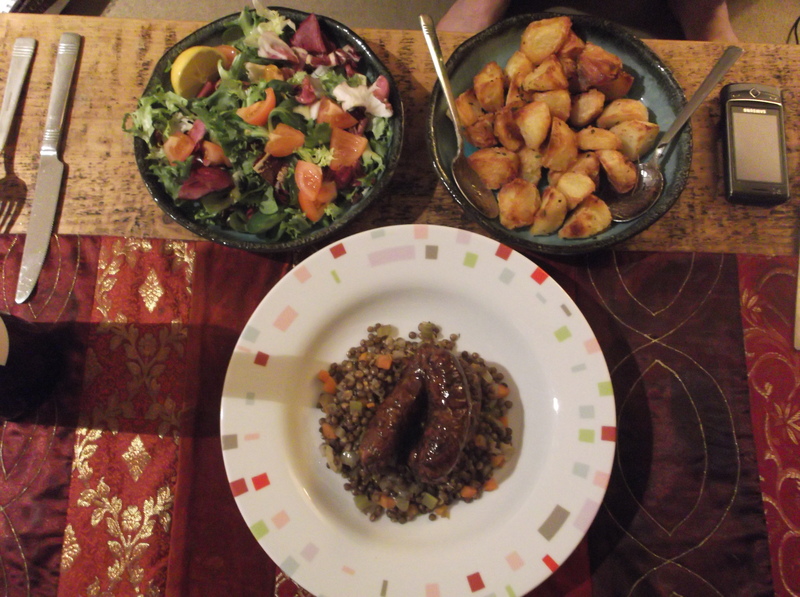 It is Colin’s birthday so for dinner a favourite of his: sausages, lentils and mini roasties. The sausages are some really meaty lads and they are sitting on top of some flavoursome lentils: cooked puy lentils sauteed with a little onion, celery, carrot, marsala and a little chicken stock. The potatoes were a triumph, if I say so myself! I used red king edwards, par-boiled then tossed with fresh thyme, chilli and 1 tbsp olive oil and roasted for 45 mins. Scrumptious- and a fitting end to a yummy week off. For lunch we went to The Royal Oak on the way to Richmond which we have been meaning to try for a while. The food was lovely and good value so we will definitely be back. Because we had both had British classics for lunch we were in the mood for something spicy for dinner, so I made a Chilli Marrakesh, second time this year, and hit the spot nicely. It was actually my birthday yesterday but seeing as we were away we postponed the annual birthday dinner until tonight. I am not sure when we started to have this same dish every night on my birthday, but it may have been when were were staying in Seville- if it was that was definitely the first and the best interpretation. So, what on earth could it be? Meatballs, tomato sauce and fried potato cubes! Not all that different to many other nights of the year!!! Tonight the meatballs were fantastic, and the sauce tangy and spicy, but inferior potatoes were a bit soggy so,unfortunately, not the best. 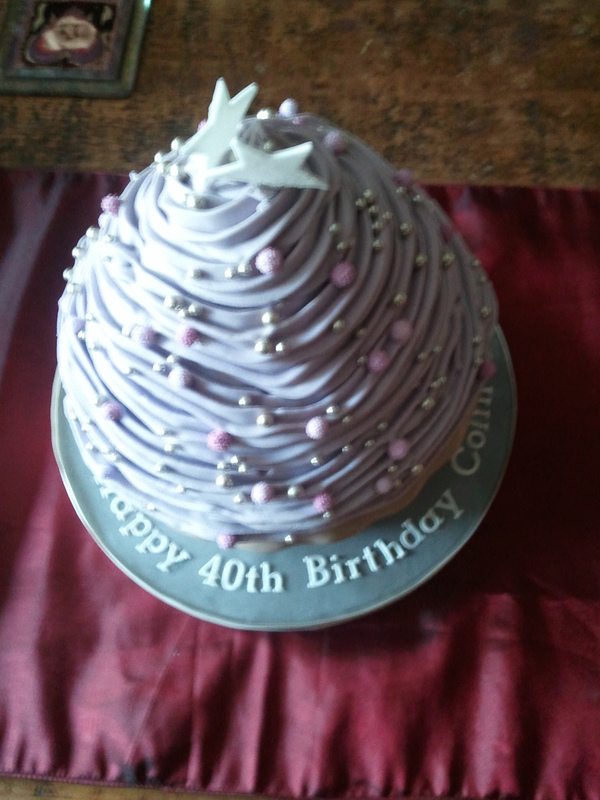 Maybe next year on my 40th it’ll be a different story? Or a different dish?!? 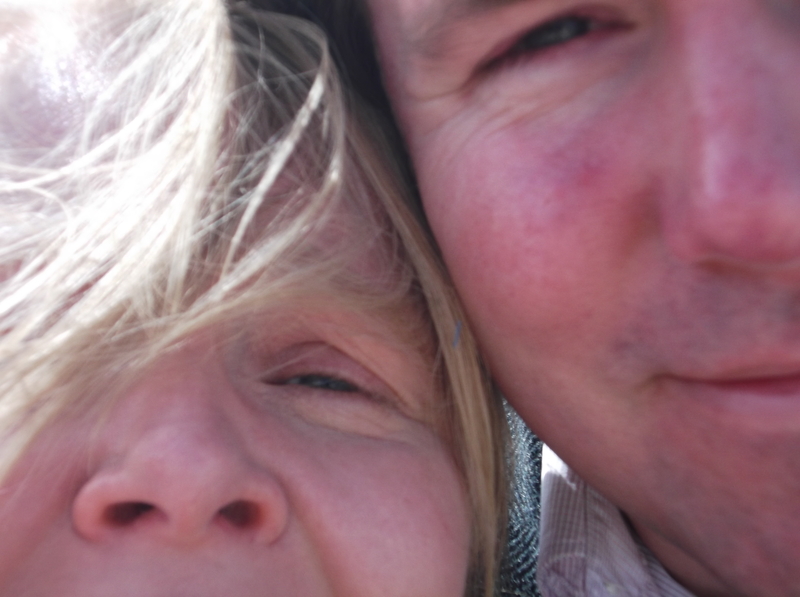 Happy Thomas’s in (a very windy…) Lisbon for our birthdays! 3 days in Lisbon were most definitely not enough! We could easily have spent another week there without getting bored once. We stayed in a fantastic apartment, well positioned in the Alfama/ Graca areas which had the best view of the rooftops and the river, and was so comfy we had some great nights sleep. 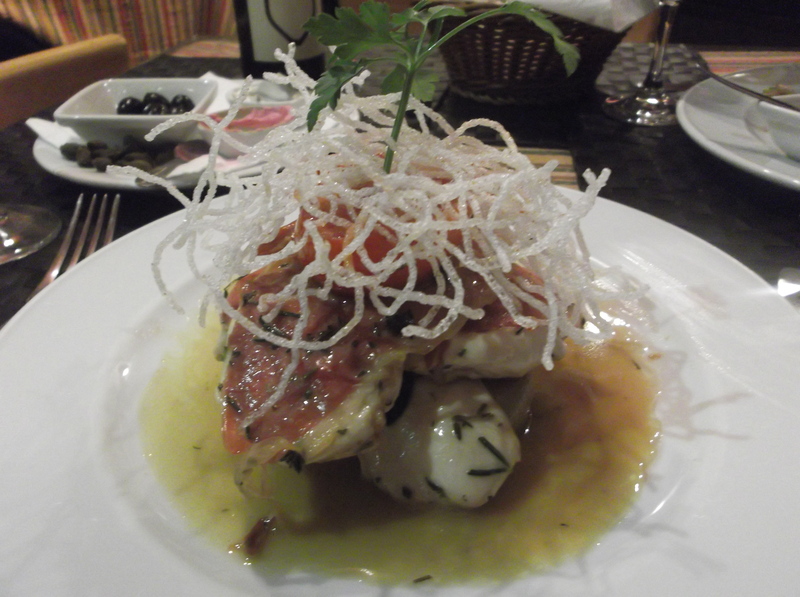 Also….. we ate one of the best meals we have ever had!!! We arrived on Tuesday at lunchtime so dropped the bags at the apartment and headed out to fill our tums. We ended up sitting outside a restaurant near the river, next door to the Saramago Collection (never far from a literary connection!) and ate some grilled fish with salad. 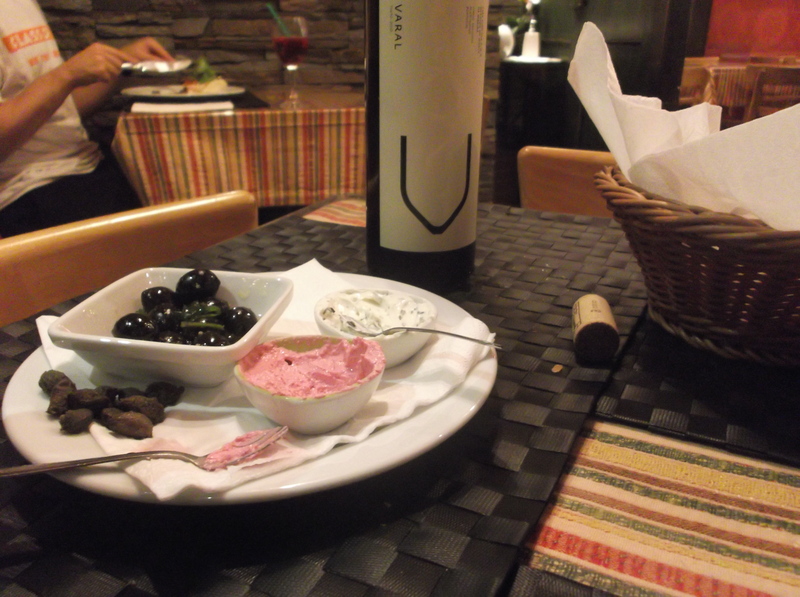 We also had our first bottle of ‘green’ wine- vinho verde, a young wine which is made to drink within 12 months of bottling. It is fresh and ever so slightly sparkling and very refreshing. In the evening I made some pasta with a salami, pepper and tomato sauce, washed down with some gorgeous red wine in our apartment. A great first day. On Wednesday we had the best meal of all time! Not just the food but the ambiance and the experience. 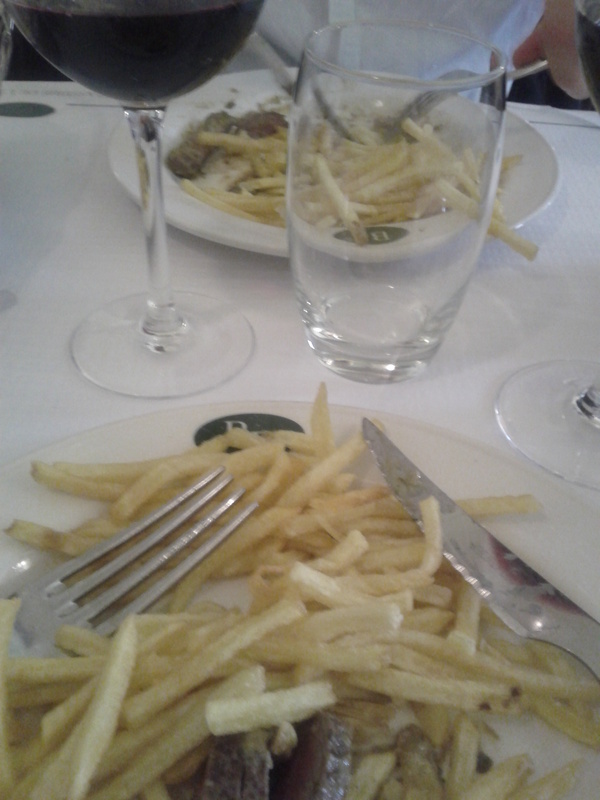 The restaurant was L’Entrecote, on Rua do Alecrim 117-120. The restaurant only serves steak, and this confidence in the quality of the cooking and the ingredients was really refreshing. The only choice was the salad for starters and the wine! 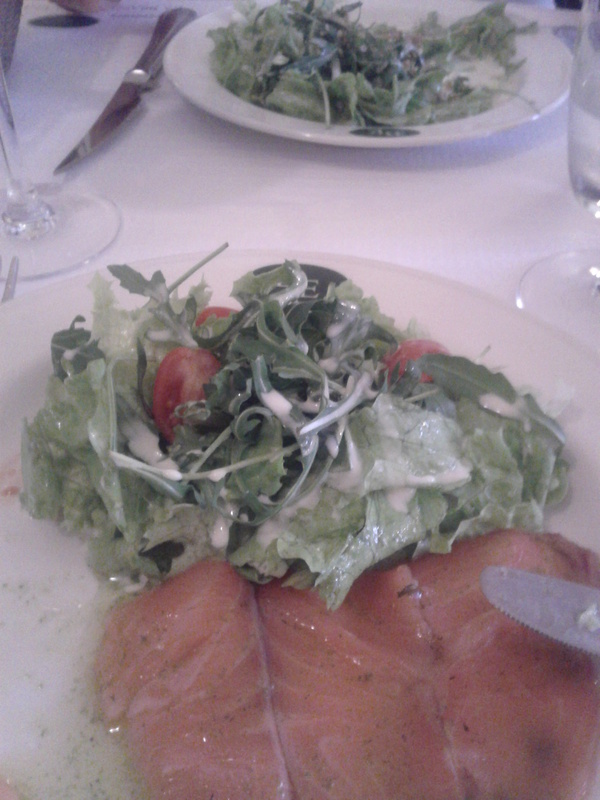 My salad was a cured salmon with cherry tomatoes. The salmon was cured in citrus juice and dressed with a delicious, herby oil, adding a freshness to the dish which was delicious. Colin had a green salad with chopped nuts and a herb vinigarette- also delicious, and a good palate cleanser before the main event. The steak was cooked medium rare and served with a secret recipe sauce- there were definitely green peppercorns in there, and lots of herbs, tarragon and parsley and more. 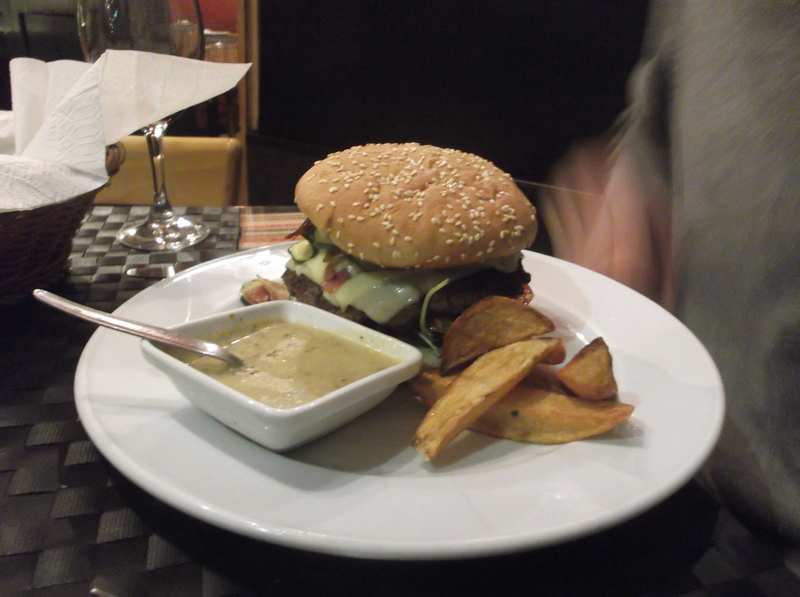 The fries were super thin and crispy and kept on coming- much to Colin’s delight!!! 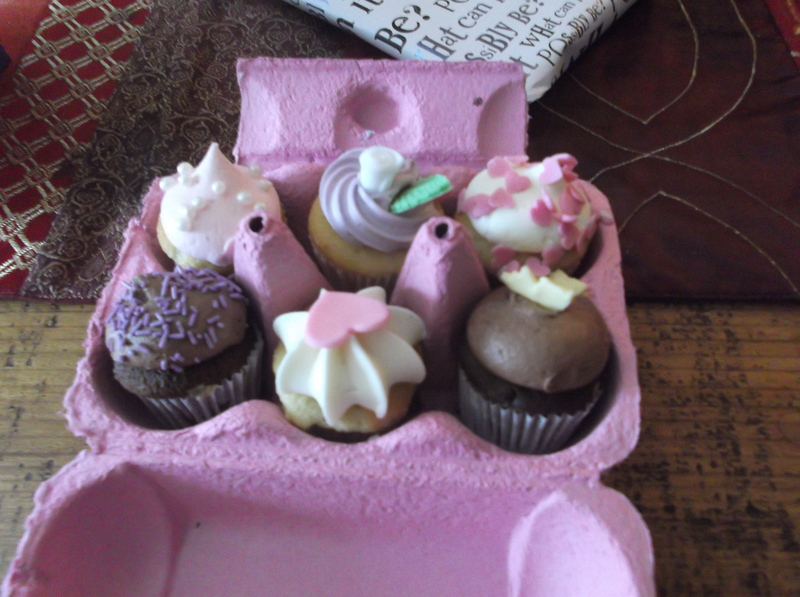 We enjoyed it so much we opted to stay for a dessert…. 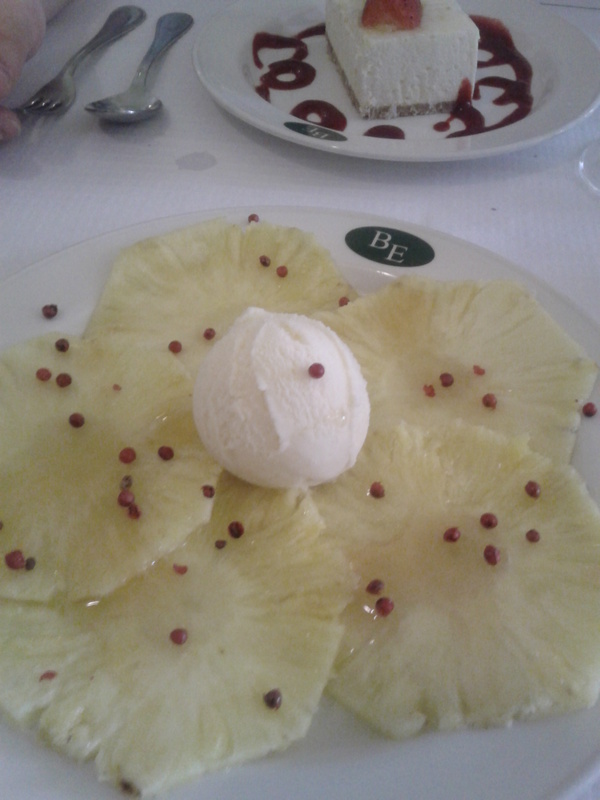 I had the pineapple carpaccio, dressed with a lemongrass syrup and pink peppercorns. I never would have believed how well these flavours worked together. Colin had a raspberry cheesecake which was light and tangy. The service was perfect and the room simple yet stylish, a little like a Parisian brasserie. All in all a perfect experience, quite possibly the best we have ever had! Thursday was my birthday and we went sightseeing to Belem. Lunch was had in a typical Portuguese restaurant, filled to the brim with locals and business people enjoying some very good food. I had sardines, grilled to perfection, and Colin had a brochette of pork which was charred, yet juicy, with salad and potatoes. Dinner was possible the 2nd best meal we have ever had! The restaurant was tiny, with only room for 18 seats, and was preparing a 1 big table for a function but agreed to fit us in. It was just around the corner and down the hill from our apartment- but I couldn’t see what it name was! 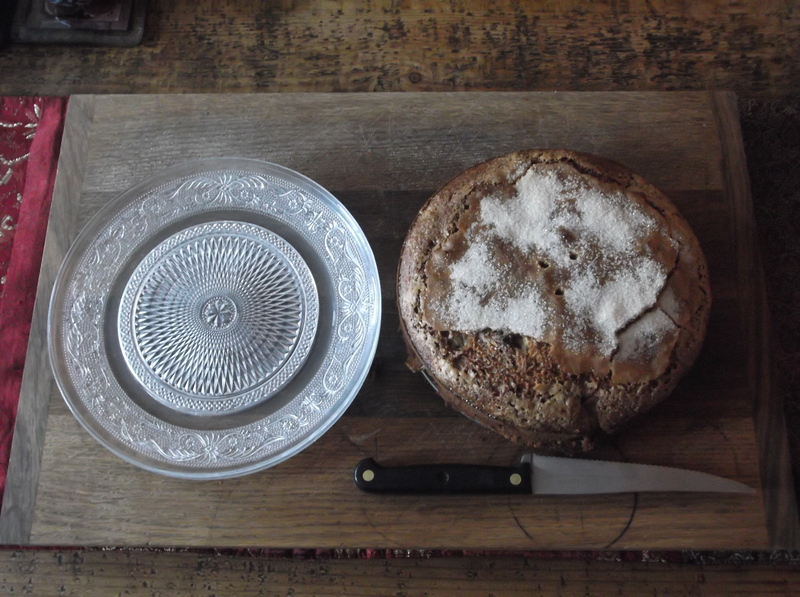 For starters we shared some warm fresh bread served with 2 ‘dips’: a bright pink beetroot puree which was sweet and earthy, and a fine herb one. Both delicious alongside some small black olives. My main course looked and tasted fabulous! This is a saltimbocca with chicken, ham and sage with a white wine sauce, served on crushed, roasted potatoes and topped with some spicy, crispy, tasty bits. Colin’s was no ordinary burger- the meat was seasoned perfectly, there were sauteed courgettes and crispy potatoes (although only 4 which was sad!) and a tangy mustard dressing. For dessert we had a passion fruit mousse and a raspberry panacotta- both light, fruity and utterly delicious. We would eat here once a week if only we lived closer!!! Unfortunately Friday arrived and to the airport we headed. But a great holiday in a fantastic city. We will most definitely be back- and soon I hope. We are officially on holiday!!! Yippee. We have not had a takeaway in quite some time, and with Colin on a late shift it was time to break the curry fast! Confidence in our usual takeaway has been shaken with some strange experiences so tonight we tried the Spice Dew which is on the road to Hampton: I pass it every day on the way to and from work and decided it was time for a try. And, delicious it was. In particular the veggie side dishes we had were lovely- bombay potato, vegetable curry, tarka dal. All washed down with a well earned glass of red- happy holidays to us! After a long day at work (well, for me at least, it was Colin’s day off…) a simple dinner beckoned. I pan fried a couple of fillets of sea bass till the skin side was crispy and the fleshy side moist and flavoursome. With this we had some chips- bought Simply Gorgeous chips I’m afraid- with a leaf salad and a tomato, red onion and pomegranate salad. Hit the spot! The final day of February – how fast is this year flying by? – and a successful culinary day! It has been my day off and a relaxing day has been had, pottering around the flat and the kitchen and catching up with reading. We had several bananas which were past their best so I decided to make some banana bread. I adapted a recipe from the Peyton and Byrne Baking Cookbook, using roasted hazelnuts instead of the specified pecans. The cake was light and moist- I used a mixture of milk and yoghurt instead of buttermilk and this worked perfectly. When Colin got in from work he gobbled up 2 slices in no time at all = big success!! I marinated some ribeye steaks in olive oil, a little lemon juice, fresh thyme, chilli and garlic for a couple of hours before griddling them until medium-rare. 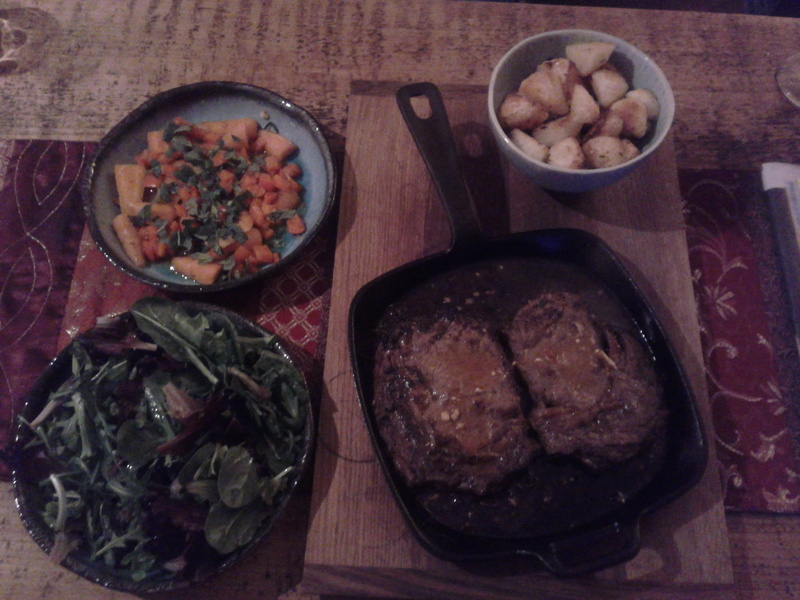 I served this with 2 new dishes- some spicy roasted potatoes and a spiced carrot salad with mint. Both were delicious and here are the recipes. put the carrots, red pepper, garlic and ginger into a saucepan, add the juices and spices, cover and simmer for 6-8 mins until the carrots are just cooked. Remove from the heat and leave to cool. chop the mint and stir into the carrots with the olive oil. Season, transfer to a serving dish and eat! Roast Potatoes with Chilli and Thyme- Colin’s new favourite!!! cook the potatoes in boiling salted water for 5 mins. Drain and transfer to a bowl. put all the other ingredients into a bowl and whisk to combine. Pour over the potatoes and season. pop into a roasting dish and roast for 30 mins until browned and crisp. A lovely day off filled with yummy food. All very happy.